Glycyrol is an important anti-inflammatory constituent of Glycyrrhizae Radix, and its anti-inflammatory effect is attributed to the inhibition I-κBα phosphorylation. 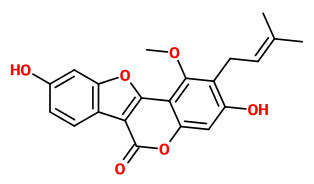 Isoliquiritigenin (IC50 = 9.0 μM) and glycyrol (IC50 = 3.1 μM) from G.uralensis have strong neuraminidase inhibitor activity. The total amounts of 14 main compounds (liquiritin apioside, liquiritin, isoliquiritin apioside, licorice glycoside D2, 4'-dihydroxyflavone, liquiritigenin, echinatin, isoliquiritigenin, formonoetin, glycyrrhizic acid, licoflavone A, licoflavone C, 4'-hydroxy-2„,2“-dimethylpyrano [5„, 6“: 6,7]flavone, and licochalcone) from licorice root samples of Chinese origin varied from 19.1 to 66.0 mg/g , with glycyrrhizic acid 7.0-25.9 mg/g.